The article below is republished with permission from Outsidelands (with some added emphasis). Click HERE for the original article. I want to thank Rex Bell for a wonderful step back in time. I’ve always been fascinated with San Francisco history. To indulge my interest, I sometimes try to imagine what areas of the City I’m so familiar with were like in the past. I recently got a little help when I discovered a detailed, descriptive article that appeared in the San Francisco Call on Sunday, November 8, 1896. The author of the article is unknown and long forgotten, but he created with words a vivid image of what was then a truly rural part of San Francisco. 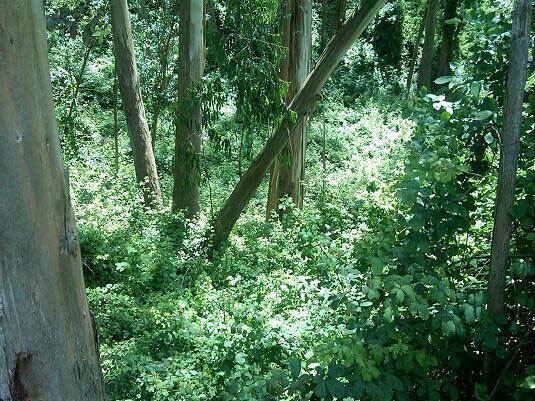 He writes about his walk along a road, very close to the City, but well hidden and isolated. He clearly describes what he sees and hears along the way, orienting the reader to his starting point, the curves in the road, and the changes in grade. 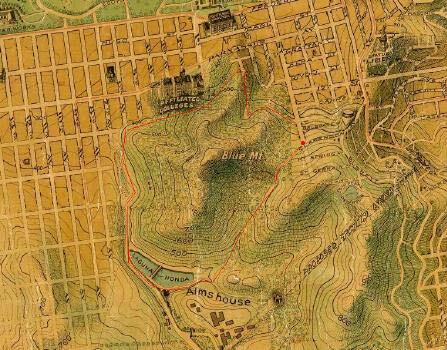 The author began his walk at the top of Stanyan Street, just above Cole Valley on the east side of Sutro Forest, on a clear Fall day in 1896. He described a place at that location where Stanyan transitioned into a dirt road that provided access to the beautiful rural path then known as the “Almshouse Road.” (So-named because it led to the Almshouse, which was an infirmary that housed San Francisco’s sick and poor of the day, located at the present site of Laguna Honda Hospital). As I studied the article, I came to realize that much of what the author described is today known as Clarendon Avenue—the street that winds through a wooded portion of the City beginning at Twin Peaks Boulevard near Clayton Street. 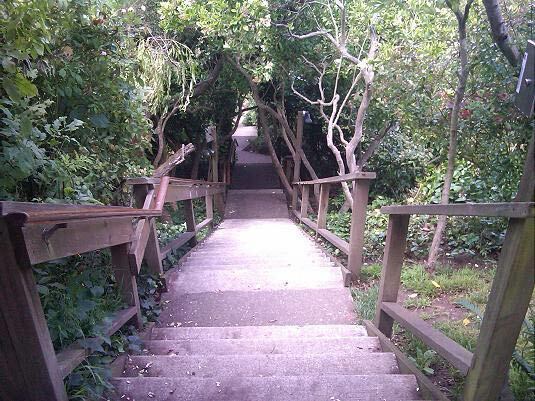 It heads up and over the hill along the eastern edge of Sutro Forest, descends down into a valley between the neighborhoods of Midtown Terrace and Forest Knolls, past the Laguna Honda Reservoir, and ends at Laguna Honda Boulevard. This is the spot where my walk began on Clarendon Avenue. 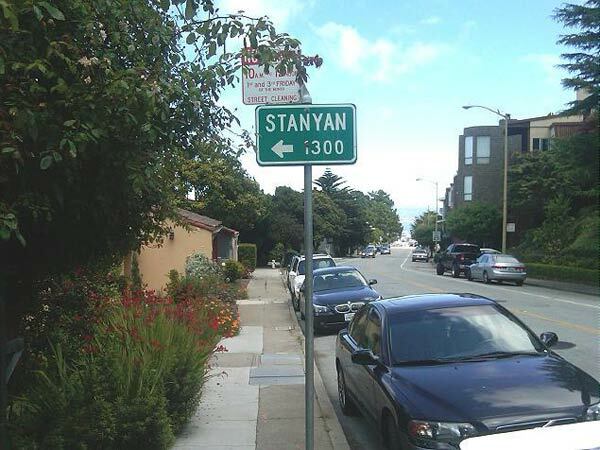 Stanyan Street no longer comes through. The sign points to several houses accessed by the isolated stairway. “What other city in the world the size of San Francisco can boast of a country road within its limits, only a short distance away from the busy marts of trade? By this is not meant a street with a rural appearance, but a real road, without side walks or lamp-posts, that winds among tree-covered hills, past ranches and gardens and pretty homes, with vines and flowers in the yard, at the same time being shut out from all sight and sound of the busy metropolis. It is very likely that the city by the Golden Gate stands alone in this respect, as she does in many others. It is also likely that comparatively few of the residents of this City know of such a road’s existence, although most of them have undoubtedly been within a few hundred feet of one end of it. The author began his walk where Stanyan Street joins Clarendon Ave. (red dot). He proceeded southwest through the valley between Blue Mountain (now Mt. Sutro) and the hill just to the east (right). 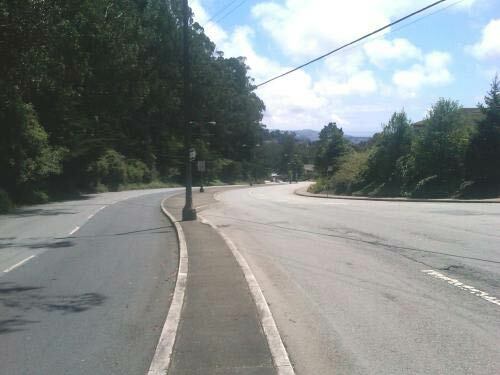 (The latter hill is the present location of Sutro Tower. The buildings identified as the “Affiliated Colleges” are today’s UCSF Medical Center). “At this point there is nothing unusual looking about the road, it having much the appearance of many of the newly laid out streets in the vicinity. It starts up a gradual incline and goes through a cut in the hill only about a block away. A little has been done in the way of improvement here. Wooden curbs have been put in and the center of the road is covered with crushed stone the same as is used in the park. But go up to the cut in the hill and look beyond. The entire aspect changes and every bit of suggestion of a city street disappears. The roadbed is simply laid on the surface of the ground and almost nothing done in the way of grading. On both sides there are hills and trees with vacant lots divided by fences. “About two hundred feet from the end of the road it makes a curve and a descent at the same time, then a sudden ascent. Here there are a few small houses, and by turning back one can look over the park and even beyond and see the smoke of the big City mingling with the clear blue of the sky. At about this location, the author turned back to look over the city. 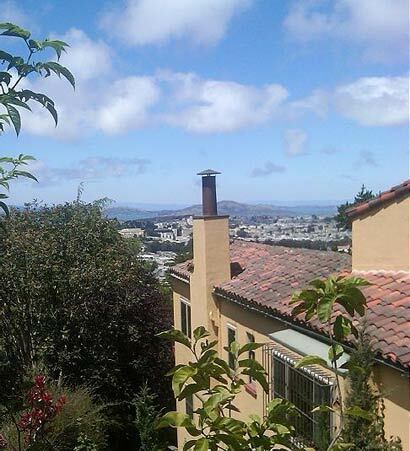 The Panhandle of Golden Gate Park is visible at the roofline of the house. “But keep on and another descent will lead into a canyon and a few hundred feet up this and all sight of the big City is lost. When once within this big canyon it is hard to realize that only a few hundred feet to the northeast there is a big City throbbing and pulsating with life. There is no suggestion of it here, and as far as the general aspect of nature goes, one might as well be in the depths of the Sierras. Away to the south the road can be seen winding among the hills, every now and then disappearing behind a bluff only to reappear a short distance farther on. Present day Clarendon Avenue. The spot is where the road “descends into a canyon”. Mt. Sutro (not visible in the photo) is to the right and the peak upon which Sutro Tower sits is to the left. It was just beyond this location where the author said, “one might as well be in the depths of the Sierras”. “There is a breath of autumn in the air. The grass on the hill sides is sparse and brown, but the birds are singing and the murmur of the brook can be heard as it tumbles over the rocks. A gentle wind rustles the dead weeds and sends the dried leaves flying. Listen. Not the faintest sound of the big City comes in here. Surely this cannot be San Francisco. But it really is, and just over the hill to the right not much farther than a boy could throw a stone are well laid out streets, all the modern improvements that make up a metropolis. 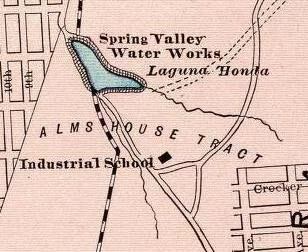 The map from 1897 shows two creeks flowing into Laguna Honda Reservoir. (The grids of streets shown on the map were never laid out). The upper creek is likely the one the author heard “tumbling over rocks”. It [the creek] no longer flows on the surface but now runs just underground at the base of the lush gully located between Laguna Honda Hospital and Clarendon Avenue (below). A section of the road that the author walked is visible in the lower portion of the photo. The cluster of buildings faintly visible at far left is the Almshouse. Laguna Honda Reservoir is barely visible in the distance near the center of the photo. 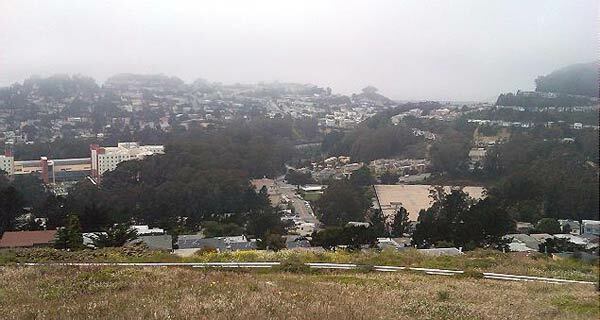 The low spot in the foreground where the road forks is the present location of the Midtown Terrace playground and the covered Sutro Reservoir. 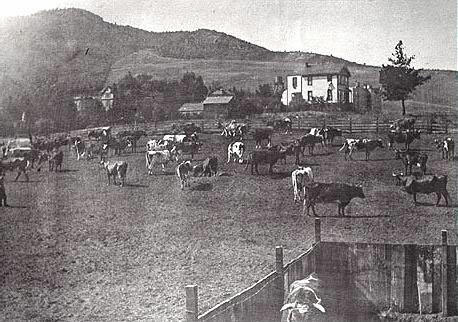 This picture was taken from Twin Peaks in 1905; not a lot had changed since the article was written. The same location as the picture above, taken in July, 2011. Laguna Honda Hospital on the left has replaced the Almshouse. Sutro Reservoir is the large flat structure at middle-right. “In the vicinity of the Almshouse the roadway is lined with pretty residences, and numerous ponds and reservoirs add to the country-like effect. Roosters are crowing, cows bellowing, dogs barking and hens cackling, mingled with the sound of the woodsman’s ax in the timber near by. “The prettiest portion of the whole road is just beyond the Almshouse gate. It might properly be named the Eucalyptus road, for both sides of the driveway are lined with the most picturesque specimens of those artistic trees. The trees are just in their prime and make a most refreshing shade, that is pleasant to look at in cool weather and cooling when the sun is hot. This avenue is about 500 feet long, and in some places the branches of the trees meet overhead, forming a natural archway, the equal of any in the State. When the sun is low in the west and the trunks of the trees cast long shadows over the roadway, then is it indeed a beautiful sight. The spots of light dance as if endowed with life, and the whole interior of the archway is filled with a soft glow that mingles with the quivering sunshine. “Half a mile from the Almshouse gate the road is of the most countryfied description. There are barns and stables on both sides, and back on the hills dozens of vegetable gardens. At present these gardens are looking their best. Great rows of all sorts of good things are in the most perfect condition of greenness, and walking among them are gardeners singing at their work. 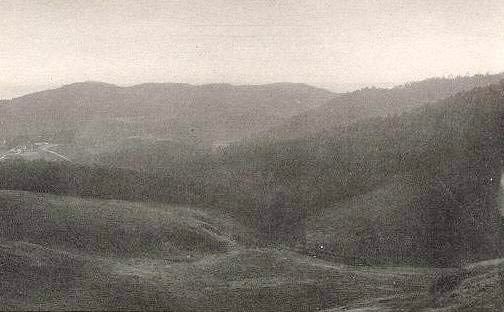 The road leading to Seventh Avenue from Laguna Honda with Sutro Forest above, 1910s. The road back to the City, about half a mile north of the Almshouse (this is the location of present-day 7th Avenue). Around the bend and over the treeless portion of the hill (left) is the area not far from where the author began his walk. The rural countryside has long since vanished, and the charming country road described by the author is now a four-lane boulevard. Most of the area has given way to residential housing. 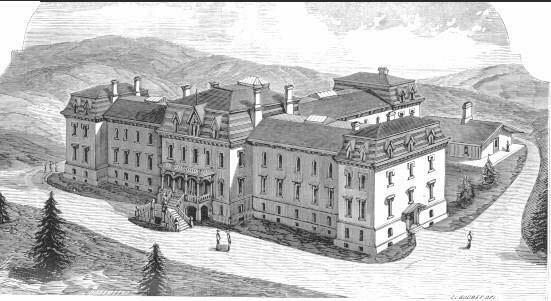 The Almshouse was long ago replaced by the Laguna Honda Hospital complex and Sutro Tower dominates the skyline for miles around. Thanks for posting this. Great article. My uncle drowned at Laguna Honda in 1933 saving a girl and her dog. So these pictures are eerie to me but much appreciated.